Intead's original article on this topic was published on ICEF Monitor here in September 2014 - but so much has changed since then, we felt only historians would want that info. Here is what you really need to know. As you know, the Chinese government blocks many Western social media platforms such as Facebook, Twitter, and YouTube so that only domestic services – such as Youku, Sina Weibo, Zhihu, and WeChat – are left for you to work with. Beyond the big social networks in China, which are better known, we will introduce you to a number of specialized websites used by prospective students to research and learn about studying outside China. It’s good to be digitally ambitious, and you may want to be present in one or more of the big social media platforms that are specific to China, such as WeChat or Sina Weibo. Though as it is with all Western social media platforms, it is good practice to only start your presence if you can maintain regular current content delivery and engagement. So, don’t take on too many platforms at the same time. Many universities use student assistance to support these efforts. This can be helpful but be aware that you need to control the registration and the login information so that you don’t lose access when your student worker is moving on. You don't want to know how often this happens. We like WeChat in particular as a fast-growing and easy-to-maintain social media platform, and we’ve included an example below of a WeChat microsite for the University of Wisconsin-Milwaukee. 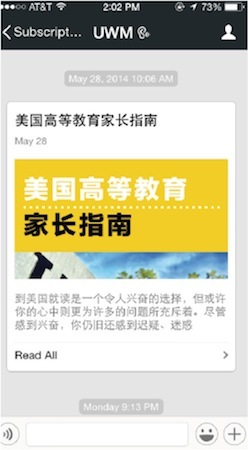 A screen capture of a WeChat landing page for the University of Wisconsin-Milwaukee. Prospective students can request information via a small menu within the app. The key is to think of the prospective Chinese student as a mobile consumer first. WeChat offers you the ability to have small micro-blogs and messages; students can request the content on demand by selecting a simple number from a menu. WeChat is a great example of a product with a “mobile first” approach, and you want targeted and relevant content that can be easily accessed via a mobile handset. Communicating with students on WeChat is now THE most common way to engage and stay in touch in China. We won't bore you with the growth stats. For the foreseeable future, this is where you need to be. Promoting on WeChat does not favor the promoter. Unlike Facebook with its finely tuned Business Manager, promoting on WeChat takes some creativity and connections to influencers. This takes time and investment. 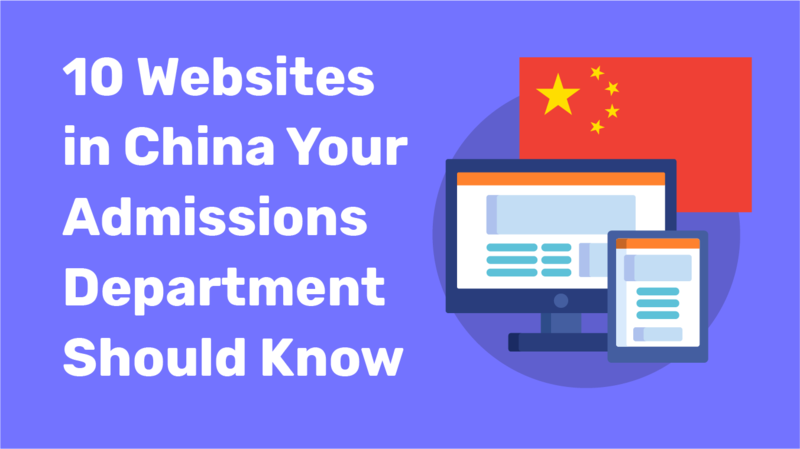 As part of our latest research project with Vericant, we have identified leading websites in China that prospective students and their parents use to explore US and western academic institutions. The italicized content in this section has been pulled from What's on the Mind's of Chinese Parents? A Research Report for U.S. Admissions Professionals on the Factors Swaying Academic Decision-Making. Visit Intead Plus to download the full report and learn more about the impact each site has on Chinese parent decision-making processes, read expanded site descriptions and explore how to increase your institutional presence via ads or organic content. Valuable research for your team? We think so. Founded in 2000, GTER is a forum focused on global education, including information about testing, applications, and student life abroad. GTER has built an objective, reliable system for rating universities abroad. GTER encourages students to take a “DIY” approach to applications, rather than working with an agent. They aim to provide a one-stop source of information and discussion regarding study abroad. GTER’s website includes a GTER Discussion Forum, a school database, an “offer index” where students share and discuss their acceptance letters, online organization tools that help students manage their application files, and more. GTER’s users are mainly 20-35 years old with a dream of studying abroad. Users are mainly located in Beijing, Shanghai, Guangdong province, Jiangsu province and some other first and second tier cities in China. There are a smaller number of users from Hong Kong and North America. The site is about equally popular among men and women. ChaseDream is in many ways similar to GTER but is more heavily focused on business school applications. Founded in 2003, ChaseDream is dedicated to developing a leading international online and offline community of young Chinese professionals and students to share experiences on GMAT and TOEFL preparation, business-school applications, student life, career development, and business opportunities. Founded in 2009, SHAREWITHU is a leading online international education and service platform in China. It provides education and services for preparing, taking exam, applying, studying and career development abroad. At it's inception, SHAREWITHU was primarily focused on MBA applications, but it now extends it's services from senior high school to PhD across every English-speaking country. The site has two million registered members and almost 0.5M active user per month. Let’s address one other challenge in managing your digital footprint in China: identifying the websites that matter in terms of reach and audience. Similar to Google Trends, WeChat Index allows you to examine the popularity of different keywords in WeChat. 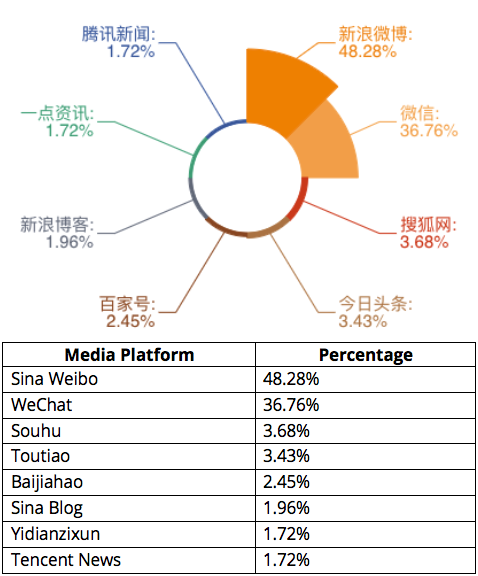 This tool integrates search and browsing behavior data in WeChat to show the overall brand trend inside the WeChat platform. It is a free tool that allows you to search any keyword in the database. However, some keywords might not be recorded in the database and for now, there is no way to add keywords as an individual user. Users can search for WeChat index in the WeChat Mini Program to locate the tool and then enter the keywords to see the trend. WeChat Index displays the trend for the last 24 hours, 7 days, 30 days or up to 90 days. 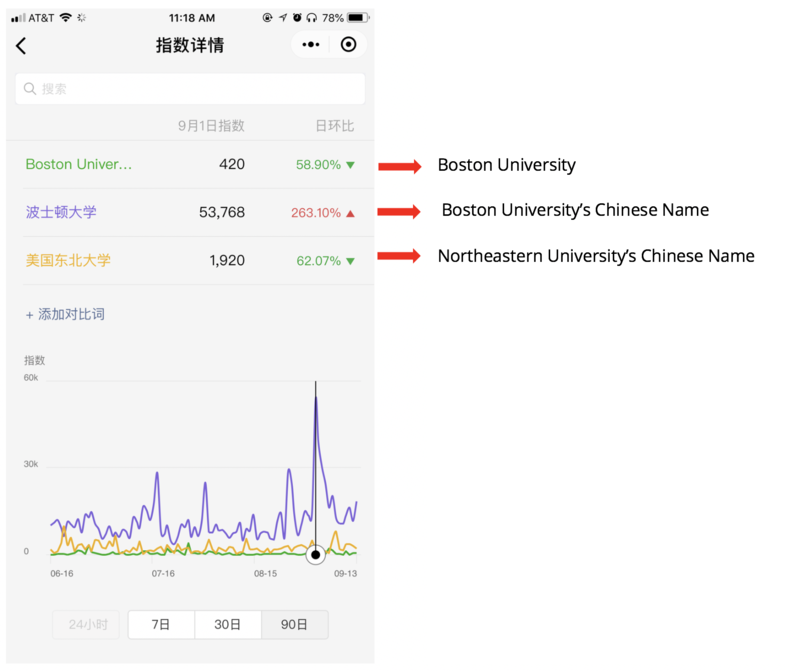 To show our Boston pride, in the following example we searched three keywords: Boston University, BU’s Chinese name, and Northeastern University’s Chinese name (Note: Northeastern University is not recorded in the database as a keyword). We can clearly see there is a peak for the BU’s Chinese name on Sept. 1, 2018. These insights are valuable for tracking brand awareness over time and measuring the large-scale impact of awareness campaigns. Similar to WeChat Index, Baidu Index provides keyword search behavior analysis inside the Baidu platform. However, Baidu Index provides more data and deeper analysis on the persona, needs, and behavior rather than trends. This is a free tool. However, same as WeChat Index, some keywords might not be recorded in the database. In this platform however, you can pay $28 per keyword and add it into the database. Baidu Index provides twelve months of data for this added keyword. Baidu Index provides more data about related keywords and how they are related to the original keyword. The size of the bubble indicates the search volume and the color indicates the increase/decrease trends. Above, we can see Boston College, Washington University, and New York University are in the strongest circle related to BU during Sept. 3-9, 2018. You can choose different time periods by manipulating the slider under the graphic. 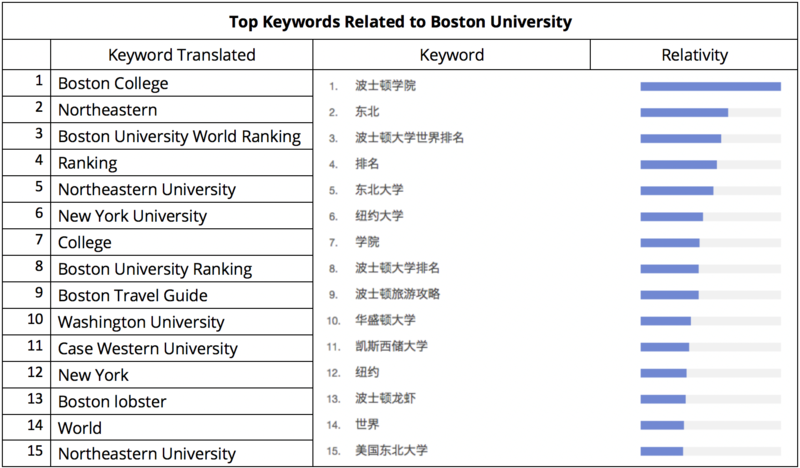 The following chart shows further analysis on the most closely-related keywords to Boston University’s Chinese name. These range from cultural perceptions – "Boston lobster" to distinguishing competitors in the market – "Northeastern" and "Boston College." These insights can help you determine your strongest competition and target keywords to enhance your relevance to the audience. 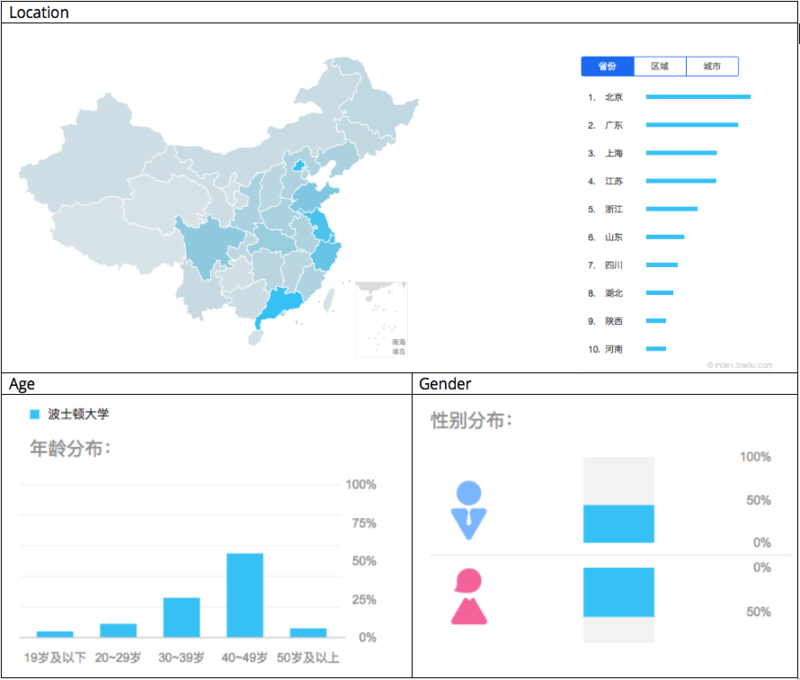 Baidu index also provides a demographic analysis for your audience. According to the data, those who search Boston University's Chinese name are primarily from Beijing, Guangdong and Shanghai. Over 50% are 40-49 years old – so they are likely the students’ parents. If you conduct this research for your institution and see similar results, you should be translating your marketing content! Remember, it's important to let prospective students' families brag about your institution in their home language. If you don't give them the amazing stories to tell about your institution, they really don't have much to say to their family, friends, and coworkers. Word of mouth marketing lost opportunity. WRD is a tool provided by Sina Weibo to collect and monitor brand social media presence and performance by keyword. They provide data not only from Sina Weibo, but also from WeChat official accounts, application, videos, news websites, government websites, forums, e-magazine, blogs, website, and foreign media data. Similar the above two tools, WRD provides keyword search trends, related keywords, and audience demographic analysis (location, age, gender, interest). In addition, WRD provides traffic source analysis, active media source analysis and – interestingly enough – emotion analysis to let you examine how your audiences are feeling about your institution. Isn't that what we all wonder? Take a look. Again, we are using Boston University as an example and screenshot some interesting data for a 24 hour period. Top 8 Media sources mentioning Boston University in 24 hours. How do audiences feel about the keyword Boston University? And where they are from? We can see the audience from Shandong, Zhejiang, and Heilongjiang provinces in general are feeling angry about Boston University. Now, what we don't know from this analysis is why students are feeling this way, but as an institution, it's important to understand popular perception of your institution and conduct further research to understand the sentiment, combat any negative feelings and nurture positive relationships. At the end of the day, remember that your digital footprint in China is a combination of all of the different web channels you use. These include your own university or school website certainly, but also the social and mobile channels in which you are active, and the extent to which they all are optimized for search, especially searches conducted by both parents and students in Mandarin. Need a little help? Still unsure where to get started? Contact us at info@intead.com or register online for Intead Plus to read our full report and gain access to a wealth of international recruitment insights.